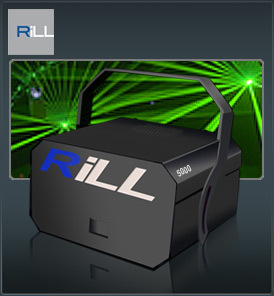 The RiLL Emerald 5000 Pro is the finest quality green laser system currently available with devastating power, and superior beam quality, this laser can easily out perform other 20watt green yag laser systems and still runs with conventional air cooling. When you need power to travel for tens of miles in the sky at night, then there is really only one answer. Put the RiLL Emerald 5000 Pro together with the PM 2000 laser controller and the best just gets better creating the ultimate is mid air effects, out door logo projection even cloud sky writing The Emerald 5000 the sky’s no longer the limit. · The PM2000 is a new high specification, laser display controller. It has been designed for professional live shows, where it is important to get the effects that you need, when you need them. With PM2000 you can take laser display frames “as is” without any modification from many different popular laser display formats, and do what you want with them using modulations in real-time. The modulation engine is extremely advanced and supports many features, including the traditional ‘rotate’, ‘flip’, ‘zoom’ and ‘rove’.